The Boxcar Children is the first title in a popular and still expanding children's series of books. And just like the book, the film is about four children - three brothers and one sister - who have lost their parents, and have been told they will have to live with their grandfather. But Henry, Jessie, Violet, and Benny don't know their grandfather at all, and imagine that, because he never came to visit, he must be a cruel man. So they run away. The first part of the story is about how they get by, day to day, all on their own. It's when they find an old, long abandoned, railway boxcar that things start looking up for them. Then the older brother can go into town to do odd jobs, and the other three can start setting up the boxcar as a real home for them. This is a children's story so of course it has a happy ending. And I don't think I give away too much to say it involves their cruel grandfather not being cruel at all. The only cautions would concern language: in one instance a character says "holy mollie" and in another someone utters "oh my gosh" but that is the extent of it. 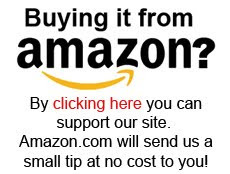 While there are a few moments of tension – especially early on when they are being chased by a couple who wants to put the children to work in their bakery – this is a pretty gentle movie. The plot is also simple, and I say that not as a criticism, but only to note this is more of a children's film than something the whole family will enjoy. Mom and dad won't mind too much, but I don't expect teens will enjoy sitting through it. But if you children who have been reading the Boxcar Children series, then this will be a treat. 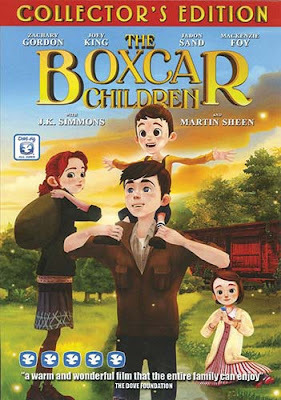 The first book in the series, The Boxcar Children, was published in 1924, but the series really started gaining in popularity in 1942, when it was reissued. The author, Gertrude Chandler Warner, went on to write a total of 19 stories about the four siblings (and I've been told that these 19 are much better than the more than 100+ that have followed). There's no Christian content in the book or the film but as you might expect from a story written almost 100 years ago, there's nothing all that objectionable either. So it is a good safe film that kids will love, and parents won't mind.